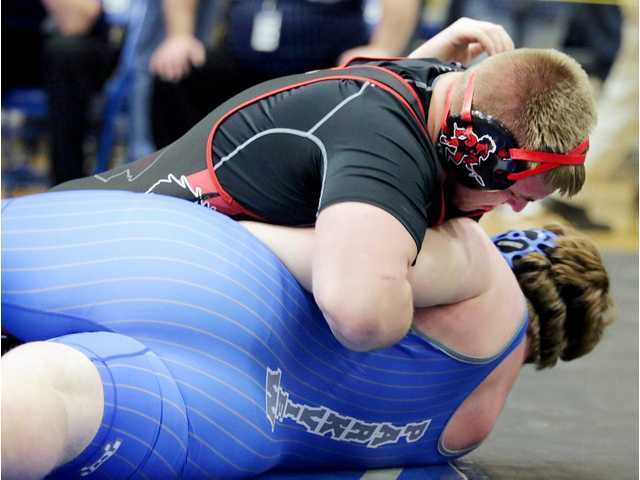 POSTED February 21, 2019 11:17 a.m.
Darlington/Black Hawk junior Leif Bredeson (36–5) spent just 2:09 on the mat getting three pins in less than a minute on his way to winning the 285-pound sectional title and earning his first career state berth at last Saturday’s WIAA D3 Mineral Point Setional. He is this week’s Mast Water Technology SWNews4U.com Athlete of the Week. After opening his day with a 31-second fall over Parkview sophomore Gage Everson (12–16) in the quarterfinal round and a 40-second fall over New Lisbon senior Joshua Woggon (32–11) in the semifinal round, the Darlington junior pinned down the title with a 58-second fall over Mineral Point senior Garrett Ward (24–15) in the championship match at 285. Bredeson will have a first round bye when the WIAA State Tournament begins with preliminary matches Thursday night at 7 p.m. the Kohl Center in Madison. He will open his state tourney with a quarterfinal match Friday morning. With a sizzling, game-high 26-point performance in Fennimore's 90–41 SWAL victory over Riverdale on Saturday, Feb. 9 senior Reid Larson etched his name atop the Golden Eagles' all-time scoring list, passing uncle Kevin Larson. The elder Larson, who graduated in 1987, finished his career with 1,547 points on 640 made baskets and 267 made field goals, in the days before the 3-point line. Reid Larson, who is a 3-time first-team All-SWAL performer went on to score 19 points in last Monday's 62–48 loss to Cuba City and finished with nine more in last Friday's 68–51 Senior Night victory over Boscobel. He now has 1,577 career points entering the final week of the regular season. Larson is the Eagles leading scorer this year at 18 points per game, as well as the past three seasons. He is also averaging 6.9 rebounds, 3.3 steals and 2.4 assists, while shooting 47.5 percent (140-295) from the field and 35.1 percent (47-of-134) from beyond the 3-point line. Larson and his Fennimore teammates will close out the regular season tonight at Southwestern (11–10, 6–7). The Golden Eagles are currently 17–4 overall and tied with Cuba City (15–6) for third in the conference at 9–4. Hennessey needed a total of 2:02 of mat time to pin his three opponents at last Saturday’s WIAA Division 3 Mineral Point Sectional en rout winning the 220-pound title and a return trip to state. Hennessey (37–1) is a three-time state qualifier and the top-ranked wrestler in D3 at 220 pounds. Hennessey’s chance to be a four-time state qualifier was wrecked by a dislocated knee cap a year ago at the SWC/SWAL Conference meet. He attempted to wrestle throught the injury at last year’s regional, but finished third with just one healthy leg. Meyer set the school's all-time scoring record in a 51-40 win over Albany on Thursday, Feb. 14. He topped Jen Wellnitz's record of 1,580 points on a 3-pointer in the first half, and finished with 21 points in the victory. Meyer has pushed the record to 1,624 points heading into the post-season. Meyer hit the 1,000-point mark for the Lady Redbirds after sinking five 3-point baskets in a 62–47 win over Iowa-Grant. Meyers' final trey of the night from the top of the key with 3:03 remaining put her at exactly 1,000 points for her career. Nies finished with 15 points on 5 of 7 shooting and passed out a game-high seven assists to lead Platteville (17–4, 7–3 SWC) to a 52–44 upset of seventh-ranked Prairie du Chien (18–1, 9–1), ending the SWC champion Blackhawks 18-game winning streak and a chance at a perfect regular season. Nies hit a pair of clutch 3-pointers late in the second half to spur Platteville’s 13–0 closing run, including the go-ahead basket that gave the Hillmen a 44–42 lead with six minutes left.